P.D. 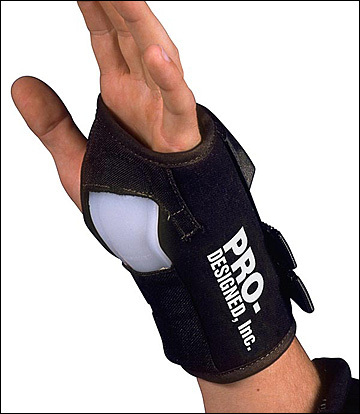 Wrist Guards from Pro-Designed, Inc. The P.D. Wrist Guards take protective gear to the next level. They are padded and constructed of 100% cotton duck with Cordura reinforcement in the high-pressure impact areas. The splint (spoon) is designed to disperse impact over a wider area. Extremely comfortable, they maintain the P.D. standard for protection and durability. *WRIST GUARDS & CUSTOM FABRICS MUST BE ADDED TO SHOPPING CART AS SEPARATE ITEMS! Why Do We Need All This Additional Information? We try very hard to outfit all skaters with protection appropriate to their build, position and sport. This means we may occasionally need to contact you regarding your order, and it means we need the other information requested here to accurately size and otherwise recommend pad products or specifications. Custom sizing is available at NO EXTRA CHARGE. Please specify custom measurements (span across knuckles and circumference of wrist) in the HAND DIMENSIONS field when placing your order, or in the MESSAGE field (Custom Sizing; 2nd Choices) at checkout. Pattern fabrics are extra and subject to availability. Please specify alternate choice(s) in the MESSAGE field (Custom Sizing; 2nd Choices) at checkout.